In a recent meeting, Mr. Saqr Ghobash Saeed Ghobash, Minister of Human Resources and Emiratisation, revealed that soon foreign workers will be able to get their UAE working visa from their home country. The Ministry of Foreign Affairs (MOFA) and the Ministry of Human Resources and Emiratization (MOHRE) have indeed started making necessary arrangements to enable workers to sign job offers back home and process their work visa and related entry visa at any Foreign Affairs and International Cooperation offshore service centers available in their country. The new procedure will have several beneficial outcomes as explained by the Minister himself. “Such cooperation and partnership between both ministries ensures a transparent contractual relation between employers and workers which prevents any attempt to replace any job offers upon the arrival of the worker to the UAE, especially since the first measures required to recruit workers from abroad shall be supervised by the UAE government through the Foreign Affairs and international cooperation Ministry,” Mr. Ghobash said as also reported by KhaleejTimes. The Ministry is going to open visa issuing centers abroad according to a plan based on three phases as follows. The number of overseas offices will be increased from time to time and the start of the third phase is expected to be at end-2016 beginning 2017. “Such centers has a major milestone effect, it will reduce fraud or identity theft cases by verifying the attendee via the passport, in addition to reducing the spread of infectious diseases into the UAE, avoid deportation and medical quarantine costs post the medical examinations which could be done at these centers, also prevent the arrival of foreigners that had already been sentenced to deportation and finally confirm the identity of the person arriving to the UAE through a clear high-quality facial image and an eye-scan done at the center”. For the other Countries not mentioned in the article, the visa system remains unaltered. This entry was posted in News, Press Review, Resume, United Arab Emirates and tagged Job in Dubai, Job Seeker, UAE, UAE Visa, Visa, Work, Work in UAE on April 24, 2016 by andreadetto. Before revealing who made this bold statement to the press recently, we shall understand the current situation in the Real Estate market in the United Arab Emirates and Dubai in particular. As we all know, the oil price has dropped by more than 50% in one year affecting not only the oil giants that had to slash investments and cut jobs but also the oil exporting Countries that registered a huge public deficit in 2015. According to Bloomberg, Saudi Arabia, one of the world leaders in terms of oil production and export, has accumulated a 98 billion dollars deficit (19.5% of GDP circa) during the past year. The fiscal deficit has been covered, in most cases, by selling assets owned by sovereign wealth funds as reported by The National, with Saudi Arabia expected to have sold 70 billion USD worth of assets and Kuwait 30 billion USD. The position of the UAE seems to be much better thanks to the diversified economy that is less depending on oil revenues and its stash of wealth that amount to a staggering 275% of the GDP. In a persisting low oil phase, however, the GCC countries have also initiate issuing new bonds and actively using the liquidity deposited in the local bank system to plug the accruing deficits. The occasion is also favorable to introduce the VAT, as already anticipated by this blog months ago, that is supposed to be operative from 2018 as reported by Emirates24/7 and to implement subsidies cuts to water, energy and fuel as lastly happened in Saudi Arabia where the fuel price jumped by 50% as reported by SaudiGazzette. In this context of reduced spending power, it seems inevitable that some of the projects currently going on could be affected as stated by Alan Robertson, CEO of JLL MENA, and reported by ArabianBusiness. He said: “2016 is expected to see more challenging conditions in the UAE real estate market as we begin to feel the impact of the continuing fall in oil prices and ongoing geopolitical tensions leading to reduced liquidity and pressure on government budgets“. Of course the wars in Yemen and Syria are destabilizing the area and contributing in the creation of additional factors of anxiety for many investors. The media started talking about liquidity problems affecting the completion of the projects and about oversupply that was pushing down the prices like the one published by GulfBusiness, discouraging the developer to complete their projects. The news flow had a worldwide echo and articles started popping in all major newspapers. It is at this point that Mr. Ziad El Chaar, Managing Director of DAMAC Properties, made the bold statement to the Sunday Times that he will “go on TV naked and resign” if the worst predictions about Dubai’s property market are realized this year as reported by ArabianBusiness. Bold statement supported by the expert absolute certainty of the strong and healthy status of the Real Estate field in the Emirates. This entry was posted in Dubai, Investments, Must Know, News, Opinion, United Arab Emirates and tagged Crisis, DAMAC, dubai, middle east, news of the world, Oil Prices, Real Estate, saudi arabia, UAE, united arab emirates on February 1, 2016 by andreadetto. It was recently reported by GulfNews that the Ministry of Labor has issued three decrees to amend some articles of the Federal Labor Law currently in force. The decision has been welcomed by experts in the regions since it represents a positive step towards a better employer/employee relationship by reducing interpretation ambiguities and possible disputes. This is particularly important if we consider that the United Arab Emirates is home of at least 4.5 million registered migrant workers with the Indian community alone reaching 2.6 million people, outnumbering the local population by far. As reported by GulfNews, the Ministry has issued three decrees (no. 764, 765 and 766) with the primary purpose of removing the link between sponsorship and labor relations and increase transparency of the contracting process. For those interested in getting more details, other than those reported in the various articles published by local newspapers and magazines, the official Ministry of Labor website is the right where to look. This entry was posted in Labor Law, News, United Arab Emirates and tagged dubai, Labor Law, News, news of the world, UAE, united arab emirates on October 1, 2015 by andreadetto. Many countries in the middle east are trying to diversify the economy in order to guarantee a prosperous future to the generations to come even in periods when the oil won’t be necessary or available any more. Among the various countries forming the GCC (Gulf Cooperation Council), the United Arab Emirates is the leader in the diversification process and this is mainly thanks to a very wise leadership. Some decades ago, oil was almost the only source of income since the volume of money the oil trade was bringing home was several folds bigger than the other voices listed in the GDP calculation. The efforts put in place in order to diversify the economy were immense. First, transforming Dubai in a commercial and financial hub, then investing in culture and innovation and last, but not least, creating the conditions for many manufacturers to establish their production in the Emirates. All without forgetting the construction sector that has been one of the most important drivers of the economic growth and the fantastic success of Emirates Airline that significantly contributed to the economic development of the Country. A strategy that projected Dubai to host the EXPO 2020, the coronation of years of sacrifices. But what about the economy? It is artificially sustained by the oil incomes or it is definitely switched to a diversified one? The results in the past decade are astonishing. Last year (2014) the GDP increased of 4.6%. 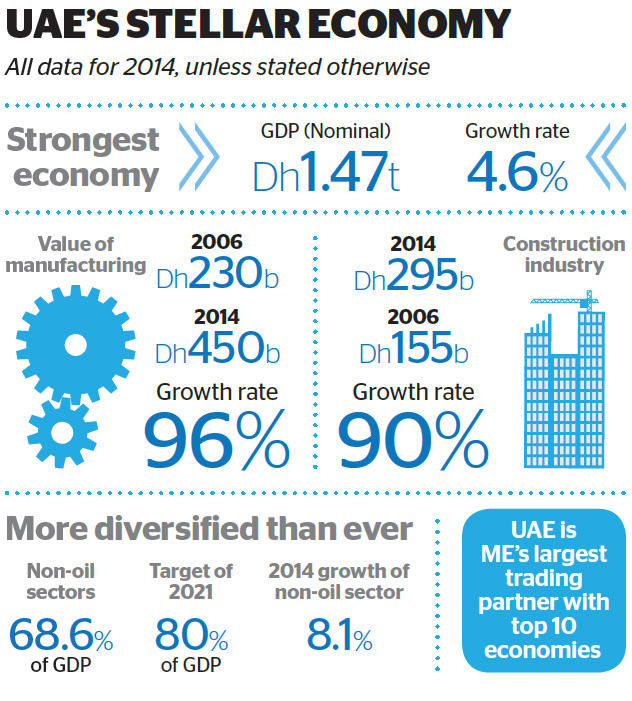 In the past decade the value of manufacturing and construction sector doubled bringing the non-oil sector to account for more than 68% of the GDP as shown in the info-graphic published by Khaleej Time few days ago after the economic data was released by the Ministry of Economy. The brilliant economy development of the UAE. A clear example of wise leadership. The target set by the leaders of the UAE is challenging. Develop an economy system where the non-oil sector accounts for 80% of the GDP by 2021, leaving the oil trade to play a marginal role in the domestic revenues, hence further stabilizing the economy. Unfortunately for the Dubaians, the progress of the economy (hence more job positions, opportunity to invest and make money) is almost equalized with the soar of the cost of living. As reported in many articles published in newspapers and magazines like Dubai Week, many Dubaians complain that their dirhams aren’t stretching as far as they used to and now the statistics prove it. As a matter of fact, the cost of life in the city has hit a six-year high with Dubai’s consumer price index rising 4.6% annually last month, the highest since 2009, following a surge in housing and utility costs. The Dubai Statics Center said the consumer price index increased 0.6 percent month-on-month. Housing and utility costs, which make up about 44 percent of the consumers expenses, soared 7.8 percent year on and 0.7 percent from April, the government agency added (details here). However, the worst of the price rises could be over, economists say, as retailers often push up prices ahead of Ramadan. A global report issued by Mercer ranks Dubai as the 23rd most expensive place in the world for expacts. This entry was posted in Dubai, Economy, United Arab Emirates and tagged Cost of Living, dubai, GDP, middle east, UAE on June 28, 2015 by andreadetto.